Altrum Nutritional Supplements provide the World’s best line of powerful nutritional supplements as a foundation for good health. Try the full line of Altrum nutritional supplements - Multi-Vitamins, Enzymes, Technical Supplements, Superfood Supplements and A. J.’s Signature Formula. 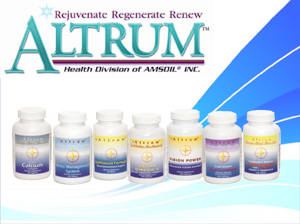 Maximize your health, energy and longevity with the Natural Power of Altrum Nutritional Supplements.